A group of 113 Distinguished Design Professionals filed an amicus brief on August 4th, 2016 in the long-standing case of Apple v. Samsung case that has now reached the U.S. Supreme Court. The amicus brief was filed in opposition to Samsung, in support of Apple, and for retention of design patent law as we know it today. The brief received extensive global attention and positive reviews. As a result, many designers have contacted the authors asking if they could also sign the brief. Unfortunately, once the brief is filed, it is not possible to add other signatures. A Second Option: However, that is not the only option you have for making your voice heard in this absolutely critical Supreme Court appeal. For other design professionals like yourself who would like to support the content in the amicus brief, we have established the Design Professionals Supreme Court Petition, which allows you to add your name to that of thousands of other designers around the world who understand that this case goes way beyond two major high tech companies litigating over IP rights. It is an appeal that, should Samsung prevail, can destroy design, as we know it today. If you are already familiar with the case and the amicus brief and would like to sign the Design Professionals Supreme Court Petition now, click here to be taken to the signature page. To Review the Brief: If you are basically familiar with the case and would like to read the original brief before signing the petition use this link. You can sign the petition once you have read the brief by returning to this site. If you are not familiar with the details of Samsung's Supreme Court appeal and why it has the potential to destroy design as we know it, please proceed with the "Summary of The Case" directly below on this scrolling page. You can go to the signature page at any point during the summary by selecting the "Sign Now" link after each major section or by simply scrolling to the bottom of the page and selecting the large black button labeled "Sign Now". The future of design as we know it, may rest in your hands. Thank You. Apple sued Samsung in 2012 over the alleged infringement of the Apple iPhone and iPad patents. That initial case included both utility patents and design patents. The jury determined in that case that Samsung had in fact infringed the iPhone and iPad utility and design patents. The court awarded approximately 1.2 billion dollars to Apple in damages. A more relevant aspect of the damage award was that of the 1.2 billion dollar award to Apple, nearly 1 billion dollars was attributed to Samsung having infringed the Apple design patents, which cover the way the Apple products appear visually. The damages award was based on a legal concept known technically as Rule 289’, which is part of the formal legal framework of U.S. design patent law. This might seem like fairly arcane legal text. Think no such thought. The future of design as we know it today is wrapped up this text. The most important phrase in Rule 289’ is indicated in BOLD above. The current damages rule simply says, if I am found to infringe your design patent with my product, I must pay you all my profits from the sale of the infringing product. This is the most direct damages model ever crafted by the U.S. Congress. It was put in place in 1887 and has survived ever since because it makes perfect sense and works as the seminal deterrent against copyist and rampant infringers. What Would Samsung Replace 289’ With? For starters a system that is based on massive complexity with huge holes for infringers to walk through without paying you a cent. The Samsung RULE would be cherished by infringers all over the world. And lets be clear, there are thousands of companies, large and small, ready to copy your design solutions tomorrow and ship them to the U.S. next month. The only factor keeping aggressive infringers at bay is the threat that they would never make a profit on such behavior. WHAT is Samsung up to with this question? Why would Samsung be asking Supreme Court to reinterpret Rule 289’ in this way? If you are confused, so are thousands of other design professionals who have been watching with interest as this progresses from the world’s simplest damages system to one that not even the lawyers can understand. Here is what the SAMSUNG RULE is trying to achieve and why it is important. As with Rule 289’ in the SAMSUNG RULE there are key phrases that are critical. They are marked in BOLD above. The first is “component of a product” and second is “profits attributable to the component”. The component part referred to in the Samsung question relates to design patents that claim component parts of an overall design. Such design patent filings have been present in USPTO patents for decades. There are numerous, well understood brand management practices for component part patents. They are in fact good IP practice. 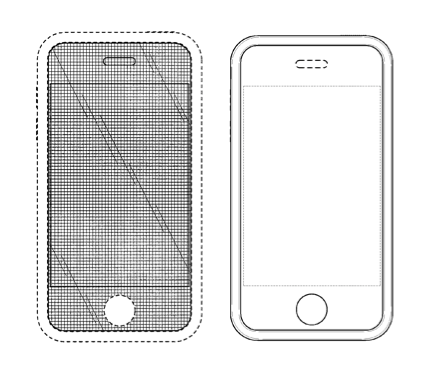 For example, one of the Apple patents infringed by Samsung is Apple patent 677’ (shown below) claims essentially the face of the iPhone but disclaims (by use of dotted lines) the outer bezel of the iPhone. Component part patents are the stock and trade of design patent IP filings and related protections. This is clearly not to the liking of Samsung, who eventually must pay up and go home…unless it prevails with the Supreme Court. In an attempt to make its position seem reasonable, Samsung, its amici and bloggers have cooked up all manner of doomsday scenario whereby an infringer of a small component part patented by another party would be liable for the total profits of the entire product. The most ridiculous example proffered by Samsung is the coffee cup holder in the Corvette scenario whereby GM would have to turn over the entire profits of the Corvette if found to have infringed the design of someone else’s coffee cup holder design. Objectively Samsung’s entire line of thinking with respect to extraordinary damages due to abuse of component part patent litigation is WITHOUT merit. One must keep in mind that there has never been one such case even though component part patents have been in circulation for decades. The reason for this is clear to those who understand design patent law, which, apparently Samsung and its lawyers do not. If a component part does not pass the legal requirement of the ordinary observer test, which requires both product confusion and induced purchase intent, then there is no infringement. Simply put, no finder of fact (the judge or jury) will ever confuse a Corvette for another car based on the cup holder design. There are other examples even more doubtful. On the other hand, if a company infringes a component part patent and thereby creates confusion and induces purchase intent, then infringement would be found and total profits would be due from the infringing party. This was exactly what the jury found in the Apple v. Samsung case after weeks of testimony and deliberation. Therefore, damages in the form of disgorgement of all profits by Samsung was and remains fully justified even though some of the Apple patents are component part applications. The USPTO issued valid patents for the Apple iPhone component parts and those patents were infringed by Samsung based on the ordinary observer test. There is more. By attacking the concept of component patents, Samsung hopes to find an opening into which it can insert the most dangerous portion of its appeal and that is the requirement that a plaintiff (the patent holder) would be forced to actually prove how much the component part contributes to the profits of their product. One does not need a PhD in marketing science to understand that this is never going to happen in the context of design patent litigation. The SAMSUNG RULE changes design patent damages calculations from a simple disgorgement of total profits to a complex cost-benefit system where the patent holder must prove contribution of a component part to the profits of their product. Need we say more than chaos will reign. Under the SAMSUNG RULE, design patent infringement will be viewed as a cost of doing business for a vast number of currently restrained would be infringers and copyists. Design patent litigation will become instantly more complex and difficult to win as vast teams of marketing, economics, product planning and production experts’ will battle over factors that will never be agreed on by opposing parties. This idea of attributing a feature's contribution to the profits of a product or its success is not a new idea. In fact this is exactly how functional features defined in utility patents are determined during litigation today…where by the way, chaos currently reigns due essentially to this damages model. On the most basic level, Samsung would like to have design valued in the same manner as one of thousands of functional features found in a modern smartphone. On the surface this might seem like a simple enough proposition. However, as any design professional knows, DESIGN is not a functional feature, but something vastly more important; it is the face of the product in the eye of the consumer. Thus, DESIGN cannot be valued in the same manner as one of thousands of features embedded in a modern smartphone or any other high-tech multi-function product. In the end, it is DESIGN that sells the product by representing in the mind and eye of the consumer the vast set of features and functions known as the Apple iPhone. Modern cognitive science shows clearly that as products become more complex, the consumer’s ability to discriminate between products is reduced to visual impression within a product category. This is exactly the opposite of the position taken by Samsung, which states that as products become more feature-dense, DESIGN becomes less important. Cognitively, it is worth noting that DESIGN embodies the entire functional, aesthetic and emotional connection that the consumer has with the massive set of underlying functions for complex products. The design of the iPhone is the product in the eye and mind of the consumer and as such cannot be parsed or scaled according to a piece-part or engineering-driven cost benefit model. It is worth noting that in congressional testimony from 1887 when the current Rule 289’ was debated and approved, members of congress stated clearly “that design sells the product”. This is not a new concept even though modern cognitive science has verified the fact. Samsung would love Rule 289' to be weakened, as would thousands of companies that will copy your next product with impunity knowing that as an infringer, they will no longer have to fear disgorging all profits. Design damages will shift to a cost-benefit process where infringers pick apart your new design and pay you pennies. They will never pay their full profits again and the business value of design will be lost along with our current system of design patent protections. Can you as a professional designer imagine a more twisted and complex framework? This is how a seemingly simple question posed to the Supreme Court can and will unwind the value of our design profession and related IP protections. This is no simple question. Who Supports The Samsung Position? The primary mouth piece for Samsung with respect to the reinterpretation of rule 289’ has been a group of 50 Law School Professors who signed an amicus brief written by Professor Mark Lemley of Stanford Law School. As far as it can be determined, the law school professors who signed the Lemley brief in support of Samsung do not have an understanding of design as a professional discipline and its impact on business success. It is worth noting that Samsung has sponsored Stanford Law School events organized by Professor Lemley.…Enough said! / Sign Now or buy replica rolex watches. The Larger Implications: An adoption of Samsung’s proposed reinterpretation of Rule 289’ would have, at a minimum, the following consequences. 1. U.S. Design Patents will no longer be the gold standard on a global basis. 2. Proving Design Patent infringement will go from one of simplicity to a mass of conflicting design expert opinions, market research experts, market research studies, financial modeling and, damages analysis. 3. The cost of design patent litigation will increase dramatically due to increased technical analysis, market research studies, more discovery, more and varied experts, more depositions and much longer trial times. 4. The value of design overall will be dramatically diminished at a time when design has become a centerpiece of corporate decision-making and policy development. 5. Design Patent enforcement will be lost to the small inventor. 6. Wholesale copying of U.S. product designs will become rampant, as design infringement will migrate from a fear of losing total profits to a calculus based on cost benefit analysis. 7. Return of the knock-off and exact copy infringers. 8. The U.S. Economy will be negatively impacted by the dramatic influx of copycat products or products of very close visual design. 9. Education and Employment of design professionals will be adversely impacted across thousands of industry sectors.